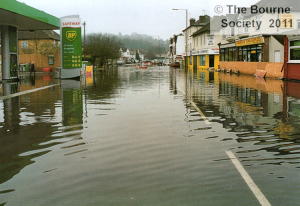 In December 2000 the Caterham and Coulsdon Bournes flowed spectacularly, causing havoc, especially in Godstone Road, Whyteleafe, where the A22 was flooded for several weeks. 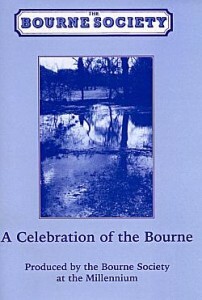 WITHIN DAYS of copies of the first edition of ‘A Celebration of the Bourne’ being distributed, the Bourne was creating trouble for the residents of Whyteleafe. There had been abundant rainfall during 1999 and 2000, so those in the know were looking for signs of the waters rising near the Woldingham Viaduct. Elsewhere in the country television news and newspapers had been reporting for many months that communities were being inundated with waters from overflowing rivers. Low-lying areas in the south of Tandridge district – Lingfield, Smallfield and Dormansland– had been badly affected by localised flooding. Yet here in the Bourne valleys, there was little sign of constant run-off except a discreet flow at the side of the cricket pitch in Kenley. However, by the last week of November it became clearly visible – a fast-flowing clear stream running alongside Woldingham Road. The situation changed dramatically on 12 December 2000. The Society’s chairman, Roger Packham, was returning home on that evening on his environmentally friendly bicycle when he and many other people travelling on the A22 at Whyteleafe found themselves swamped by rushing water, which was being swirled into neighbouring properties by speeding vehicles that did not realise how deep it was. Heavy rainstorms – almost an inch of rain had fallen in the district in the previous 24 hours – had combined with the flow of the Boume to create havoc. Sewage rising through the manholes added to the problems. A number of vehicles became water-logged and had to be pushed out of the water. Water levels rose to 2 ft and were there to stay for the best part of a month. Local newspaper reports on 15 December described the misery inflicted on nearby firms and residents. Businesses had to close and properties were without electricity in the run-up to Christmas. The Surrey Mirror had a photograph of a canoeist in the garage forecourt and reported that by coincidence the floods struck as a printer in Godstone road was producing copies of local weatherman Ian Currie’s new edition of his Surrey Weather Book. Over 6000 sandbags provided by Tandridge District Council were stacked to keep the water at bay from low-lying properties. Nearby gardens were completely flooded for many weeks. Affected schools closed early for their Christmas holidays, causing problems for people far beyond the short stretch of road that was immediately affected. After the first hours of the drama, for many days Godstone Road was strangely quiet. It was closed off from Purley to the Whyteleafe traffic island, leaving some travellers with long walks to jobs and homes. Others waited frustratedly at bus stops without realising that no buses would be forthcoming. Only a few intrepid heavy vehicles attempted to drive through the water, which showed no sign of diminishing. The major road had turned into a lake, with children playing in boats or contentedly paddling through the waters. Those without wellington boots surveyed the scene disconsolately. The watery problem made headlines in the local press until the end of March. Local Members of Parliament Peter Ainsworth and Richard Ottaway called for action, and the Chief Executive of Tandridge District Council met with representatives of Thames Water, Sutton & East Surrey Water, the Environment Agency, Surrey County Council Highways, Croydon Council and the Police in efforts to find a speedy solution. Eventually pumps were set up and six inch wide hoses pumped water from the vulnerable areas near Maple Road to a little further down Godstone Road near The Rose & Crown, where it was allowed to run alongside the road and down the drains again. While the pumps were running there was little water to be seen, but damage to the surface of the road prevented it from being reopened for a further few days. A large bund was created to the north of the allotments to contain the water before it reached Bourne View, in a determined effort to prevent polluted water from reaching the Kenley Water Treatment works. Had it done so it was reported that water supplies to 100,000 people in South Croydon and North Tandridge would have had to have been cut off. Throughout the crisis Thames Water was criticised for not having enlarged sewers over the years. After the water levels had subsided to a manageable level a large machine was brought in to clear the culverts of debris. This ferocious machine blasted its way through the pipes crushing into fragments anything in its path. Such items as a mattress, a plastic chair, a water heater, and four and a half tons of silt were removed from the pipes. Thames Water set about decontaminating and cleaning the gardens of homes that had been under water for weeks. When Keith Hill, the Minister for London, was questioned in the House of Commons about the flooding, he replied that the Bourne had only flowed three times in the previous 20 years and the water was prevented from draining away on this occasion by blockages. He added that the pumping arrangements to bypass the blockages had not been straightforward as they also had to protect Kenley Waterworks. Who was responsible for the Bourne? That was a problem that beset local residents in 1904, and our records do not show how the problems were solved then. In 2001 residents were told by the Environment Agency that the Bourne was not its responsibility because it was not a main river. In a repeat of the situation of 100 years ago, residents were told that each property owner under whose land the bourne flowed is responsible for its maintenance. Tandridge Council and other agencies have authorised a survey of the Bourne that will cost £50,000. On 14 February 2001 heavy rain again combined with the Bourne created havoc for a second time, but was more quickly dealt with. Early in March, however, Whyteleafe School was still contending with potentially polluted water and gardens were still flooded. Away a few miles further north another bourne rose. Our local paper had dramatic pictures of the West Wickham bourne. Where the water bubbled out of the ground there was plenty of room for it to flow over rugby and football pitches alongside Addington Road, although nearby gardens did suffer as well. It made an impressive lake over two feet deep. The West Wickham bourne rises much more rarely than the Croydon/Caterham bourne and traditionally two months later, which it did on this occasion. Because of the understandable commotion in Whyteleafe, the flow of the Bourne at Coulsdon received no mention in the local press and the floods in Woldingham Road received scant attention. The cricket pitch at Kenley where the Bourne runs alongside the A22 had also been flooded at times. There it had room to spread without causing more severe trouble. Before the inundation in Whyteleafe, The Advertiser had reported that the Bourne had flooded cellars nearer to Croydon. Reports of the 1968 flooding in The Advertiser on 6 December 1968 written by the Bourne Society’s James Batley comment that ‘From Woldingham…. the open stream flows between allotments and the railway, then under Whyteleafe Grammar School playing field, the school itself and Whyteleafe Road. The open stream continues by the coal yard, snakes across the main road to the gas works – where recent improvements seem to have put paid to the gasometer (sic) lake(!) – before emerging behind The Rose & Crown.’ The gas holder lake is prominent in 1904 photographs. It appears that in 1968 the biggest problems were closer to the source of the Bourne beneath the works and offices along Godstone Road towards Wapses Lodge. The Bourne has a very old tradition of predicting national disaster – locally, in the distant past it must have caused disaster for the people living in low-lying areas of Croydon. Sewage-polluted water in marshy areas must have been disease-ridden in the extreme. Now the waters have become culverted further and further upstream, the problems appear to be moving further upstream. The Sutton & East Surrey Company tell us that the Bourne for 2000-2001 was recorded at Kenley Weir for 203 days. For the 100 years that the company has recorded Bourne flows, there were only two others that exceeded 200 days, the 1968-1969 flow and the 1974-1975 flow. The most notorious flood in 1903-04 only(!) ran for 181 days. The last few lines in ‘A Celebration of the Bourne’ poetically suggest that the Bourne need no longer be feared. How wrong can one be! As the countryside in 2001 is suffering from a major outbreak of foot and mouth disease – that happened too in 1968 – perhaps the Bourne did foretell national disaster? Our local newspapers are to be congratulated on their coverage.